Vank Cathedral, a cathedral in Isafan city, Jolfa district, was built during Safavid dynasty by Armenians who were resettled in Isfahan following Shah Abbas II’s order. This cathedral is ornamented by various forms of art from which the most significant ones are the delicate blue and gilded paintings on the ceiling and central dome depicting the Biblical story of creation of the world. The paintings on the wall are inspired by Italian paintings. 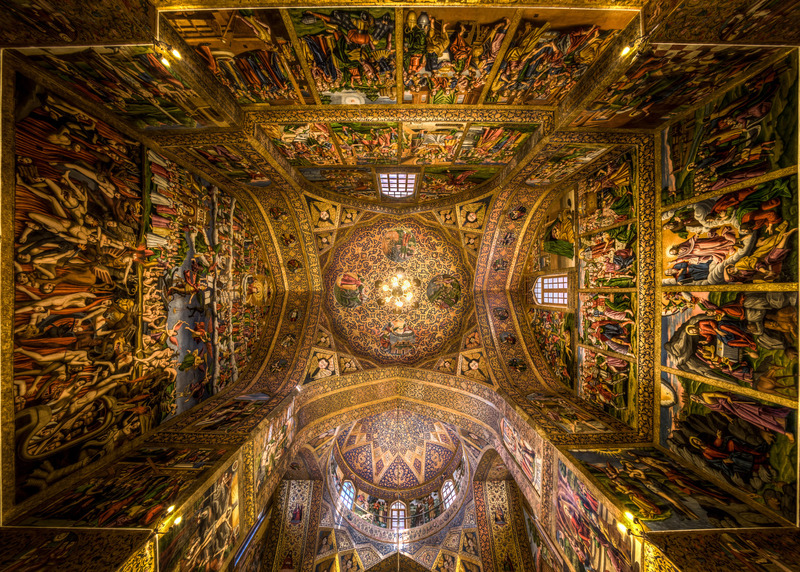 The church is still used by Armenians of Isfahan in current day and is open for visits as well. I was amazed by the golden color of the ceiling and also unique paintings all around. I putted my camera on the floor and it was oriented to up. For capturing this photo, I used wide lens.